Students in Math Jump work together in a group. 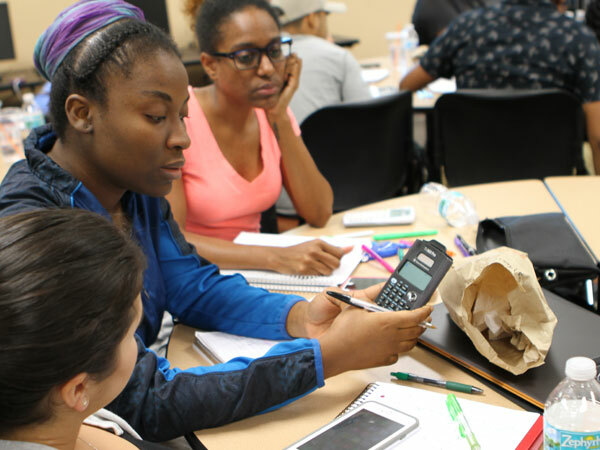 “Math Jump” and “Jump Write In!,’’ both faculty-led initiatives on the Lake Worth campus, required participants to spend eight or 10 hours a day, depending on the program, for five days. They spent the time getting ahead on content they will cover in their intermediate algebra, college algebra or English composition classes. Math Jump launched in 2015 as a pilot program partially funded by the College’s Title V grant that targets Hispanic students as well as those eligible for Pell grants. While it is open to all students, those receiving Title V’s First Step 2 Success Scholarship received priority registration. Math Professor Alex Opritsa, who created the program with Carlos Ramos, associate dean, and taught the initial class, said all of the 18 participants in the pilot program passed their math classes in the subsequent fall and spring terms. Therefore, last year, the program expanded to include college algebra. The College added “Jump Write In!,” led by English Professor Valrie Martin-Buchanan, this year. Both programs employ additional math and English tutors to assist with the training. Cara Good, Title V program grant manager, said “Math Jump” and “Jump Write In!” fit nicely with the goals of the federal grant to provide additional academic services and support to help with retention and graduation rates of the Hispanic students and students who qualify for Pell grants. Excellent program! Thank you professors Opritsa, Carhuamaca, Dean Ramos. Several Global Education Center students took advantage of this wonderful gift and they are raving about it. They feel prepared for their fall semester. I did this. I wouldn’t have made it through algebra without it. I passed with A’s. It was a great group of people & Professor Opritsa made it easy to learn!! This is one of the best decisions I made!! !